Thank you so much for the fast response and I can't wait to see the next update! Thanks for reporting the issue. It'll be fixed in the next version, assuming the root cause is the same one as I have identified previously. Meanwhile, there is a (cumbersome) workaround: Unloading and reloading the plugin should fix the problem. Edit 2: The problem is fixed in version 1.44. Thanks again for your very specific bug report! Last edited by Thurallor : 01-20-2019 at 03:07 PM. I've narrowed it down that it has something to do with the 'Defer this until next login' arrow on the main window (not on the popup). 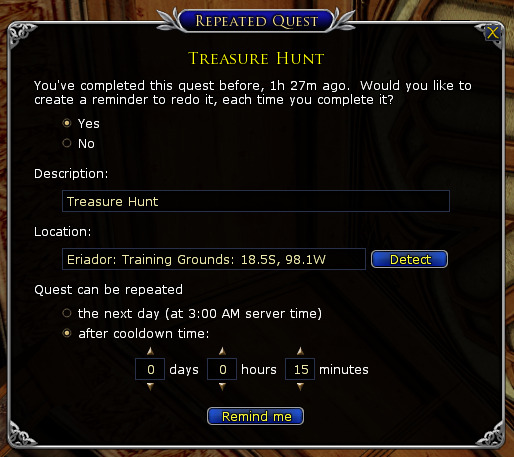 Really like this plugin - it has helped me with many different tasks in game. I do want you to know that although I haven't been able to narrow down exactly what action is causing it (still working on that), I've narrowed it down that something to do with your plugin is causing the long-standing camera zoom bug to happen more frequently for me. If you're unfamiliar with the bug, here, here and here will explain it a bit better. There are a ton of threads about it. I'm fairly certain it has to do with the closing of the main window and changing/losing focus....but I'll keep working on it and update here when I think I might have it figured out. This bug is annoying because the only way to fix it is to completely exit the game. Logging the character out has no affect once the bug starts. I narrowed it to your plugin by only having that plugin load, having the reminder popups set to "at login" and the only actions I performed were opening the main plugin window by clicking on the icon, resetting the timer and closing the window via the X - to have the mouse zoom suddenly stop working. It's pretty predictable. Yes, that does work great. The notification popup works for me and the repeat options as well. Thanks so much for adding those features. Please try the new version (1.40). It adds (optional) popup notifications. It also adds support (in a way) for your desire to have reminders that occur, for example, every 20 minutes. 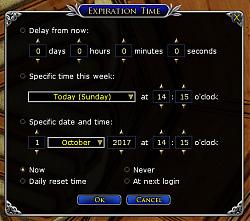 You can configure the "postpone" button that appears when a reminder expires. Right-click on it to define what it does. Last edited by Thurallor : 04-25-2018 at 02:06 AM. Maybe you could make it an option when creating a reminder whether to have a pop up reminder or not. My guess is that I missed the reminder firing because the only indicator is the number on the Reminders icon. Is there not anyway to have an audible or popup reminder when the reminder goes off? An audible notification isn't possible, but a visual one is. My sense is that most users would find it annoying to have a window open every time a reminder expires, which they would then have to click on to close. But maybe an optional message could appear in the middle of the screen, and/or a more conspicuous change in the reminders icon. Thanks for the replies Thurallor. I did some more testing and the countdown timer function does work. My guess is that I missed the reminder firing because the only indicator is the number on the Reminders icon. Is there not anyway to have an audible or popup reminder when the reminder goes off? Currently there is no way to do this automatically. I'll think about a user-friendly way to add it. 4)Ability to share reminders between characters. This is already implemented. 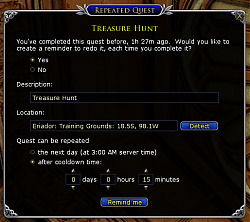 All characters on a server can view all of the reminders on that server. If you mean something else, please specify. I highly appreciate all the work you do for the game and I use many of your plugins. I look forward to see what else you do with this and your other plugins. Very glad to hear that, and thanks for the feedback! Last edited by Thurallor : 03-25-2018 at 03:50 PM. 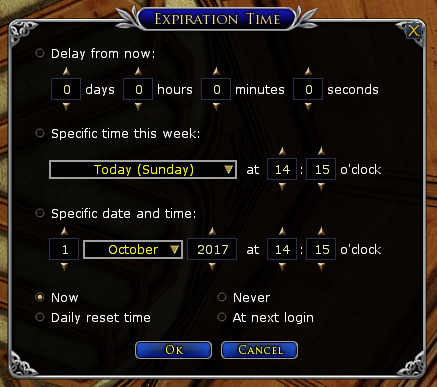 I'm still experimenting with this plugin as I am reminder junkie outside of LOTRO. During the festival some ideas came to me that I dont see a way to do in your plugin. My nagging apparently was successful, and the problem was fixed in today's game update. Heya So I just downloaded the plugin and have a few issues. Well, one major one Instead of options, etc. I only get ?† for virtually everything in the options panel (excluding my toon's name). I'm using the English client and am somewhat baffled as this has never happened before Any chance you might know what causes this??? This is due to a bug introduced in Update 22 that breaks any plugin that has Russian language support (of which Reminders is one). I'm clinging to the forlorn hope that SSG will fix the bug in tomorrow's hotfix. If not, then I'll release updates to all of my plugins with a workaround. Meanwhile, you can apply the workaround yourself by installing the latest version of Listbox Patch. That will get rid of all of the "†" stuff and occasional Russian text. Sorry for the inconvenience, but you can blame SSG for basically not caring about plugins. Last edited by wynniekins : 03-13-2018 at 05:01 AM. Sometimes I can't open the settings panel. And everything gets put into a single tab. Hoped it would make tabs for each of my alts. Will try 1.36 and see what happens. You need to make your own tabs. Right-click on your existing tab and choose "Create tab". Or click the little "+" sign to the right of your existing tab. Then you can go into the settings and choose, for each of your alts, which tab you want the automatic reminders to be placed under. Last edited by Thurallor : 02-23-2018 at 11:52 PM.